This is the mini you have been waiting for. 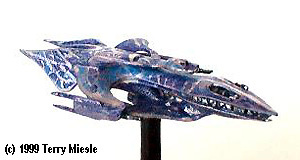 As one of the first in a new generation of Babylon 5 miniatures from Agents of Gaming (along with the Tanishi and Thunderbolt), the new sculpting and molding are immediately apparent. This is a well-made unit. It assembles like a charm, it looks great compared with the WB artwork, and is greatly appreciated. The mini is 3 pieces, a main body, a lower wing and the bridge. My bridge was a bit bent, as thin as the metal is this is no surprise. I was able to bend it into shape easily. The two main pieces were unbent and clean. A minimum of flash cleanup was needed, after which the customary cleanup with dish soap and a soft toothbrush was applied. The Whitestar has a very distinct color scheme. The mottled purple, blue, and silver/grey is a daunting task at first consideration, but can be broken down to make the process managable. I'll detail the steps below. 1. Dryfitting. Of utmost importance with this mini is making sure the fit is perfect before continuing. Painting is easier with this design dissembled, so you'll need to make sure everything is perfect before beginning. The bridge was the only part on my mini which needed a bit of bending, though some filing of the lower wing/fuselage joint needed a bit of filing. 2. Priming. The entire mini was primed with Tamiya Acrylic Flat White. This was followed with a coat of Gunze-Sangyo (GS) H39 Purple Gloss Acrylic. After this had dried, a mixture of GS H323 Light Blue and H39 Purple 3:1 was applied in a pattern discerned from the WB artwork. This forms the base for the next stages. 3. Dazzling. The Whitestar glows with a silverish-grey sheen, almost like a dolphin's skin. On top of this is a pattern of the same color, flowing lines reminiscent of nerve ganglia. To achieve this, the entire surface was stippled with Testors Model Master (TMM) Chrome Silver Enamel. Stippling is like drybrushing, but using a stiffer brush with bristles which separate into small clumps, and using a stabbing instead of scrubbing motion. This will allow distinct spots of paint. 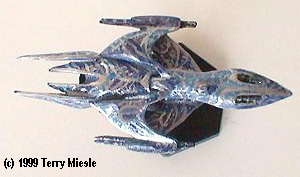 After this had dried, I began painting lines with the TMM Chrome Silver to mimic the artwork on the ship. This is somewhat subjective, a chariacture of the subject, as the scale of minis just won't allow exact duplication. You'll want to suggest the appearance of the subject, not strive for exact duplication. 4. Lines and Separation. After stippling, I coated the mini with GS flat clear topcoat. This makes the chrome silver look like a light metallic grey, it also removes the shiny character of the chrome. After this had dried, I began painting lines with TMM Chrome Silver again, overpainting the existing lines to provide some sheen. 5. Gunmetal. The nose of the Whitestar has the guns and some exposed machinery. This was painted with TMM gunmetal, then drybrushed with TMM Chrome Silver. The wing guns received this treatment as well. 6. Assembly. The mini was then ready for assembly. The bridge section is easily bent, so care must be employed. I must comment here on the ease of assembly. The mini went together like a charm. A minimum amount of CA adhesive glued the pieces together without visible gaps. 7. Base. I used the supplied game piece base. This is the standard two-piece plastic base from AOG. This is OK for a light mini like the Whitestar, but I took an added measure of insurance. I drilled a hole in the base to accept a length of straight pin, and a corresponding hole in the mini. This provides a metal link between the two for added strength. The base is superglued in place. Summary: This is one of the most satisfying minis in the AOG line. The casting is among the best I've ever seen, the detail is appropriate and accurate, and the subject is well appreciated. I think anyone who is willing to tackle the painting task will not be disappointed. I'd like to build a dozen of them as the spearpoint of my fleet.